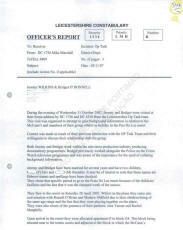 3407 to 3409 Officer's report re:2007.11.05 visit to Wilkins and O'Donnell. 13-Volume XIII p. 3407 - 3409. He found Gerry to be amicable and willing to chat. 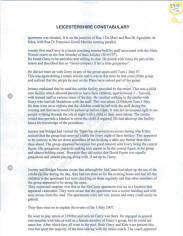 He paired with Gerry for part of the lesson and described him as "Good company if not a little gregarious"�. At 1230hrs both Jeremy and Bridget went to pick up their children from the creche. They did not have any interaction with the group again that afternoon. They decided to spend the evening in the apartment. Their son was unable to sleep so about 2015hrs, Jeremy took him, in the pushchair for a walk. He walked around the main area of the resort and eventually ended up in the Tapas bar where he used the toilet facility. He was unable to state what time this was. His son was still awake so he walked in the area of the ocean club gardens and walked along the alleyways in that general area. He eventually made his way along Rua Dr Francisco toward the direction of Rua Dr Agostinho. At this time he was walking on the right side of the road passing the Tapas bar area to his left. He noticed the bad street lighting and although it was not completely dark there was enough light to see clearly. 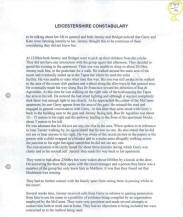 As he approached the corner of the McCanns apartment, he saw Gerry appear from the area of the gate. He crossed the road and engaged in general conversation with Gerry. 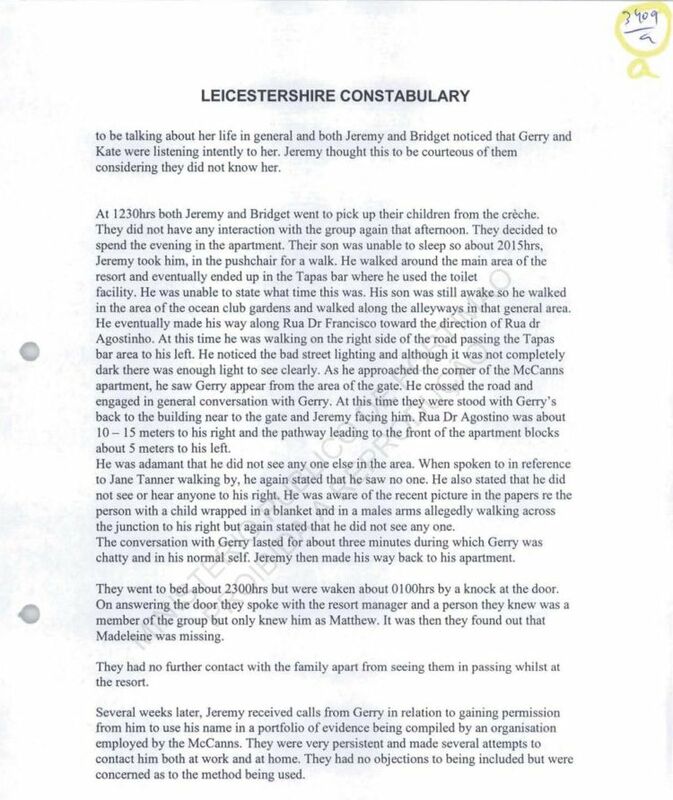 At this time they were stood with Gerry's back to the building near to the gate and Jeremy facing him. Rua Dr Agostino was about 10-15 meters to his right and the pathway leading to the front of the apartment blocks about 5 meters to his left.